OpenNebula 4.6 Carina is Out! The OpenNebula team is pleased to announce the immediate availability of the final version of OpenNebula 4.6, codename Carina. This release introduces important improvements in several areas. The provisioning model has been greatly simplify by supplementing user groups with resource providers. This extended model, the Virtual Data Center, offers an integrated and comprehensive framework for resource allocation and isolation. Another important new feature has taken place in the OpenNebula core. It has undergone a minor re-design of its internal data model to allow federation of OpenNebula daemons. With OpenNebula Carina your users can access resource providers from multiple datacenters in a federated way. With Carina the OpenNebula team has started a journey to deliver a more intuitive and simpler provisioning experience for users. Our goal is level the final user usability with the system administration and operation ones. OpenNebula Carina brings a new cloud provisioning portal with a simpler, clean and intuitive design. The Sunstone graphical interface has also been tweaked to help implement common cloud admin workflows and improved in order to support the new Marketplace version, which makes even easier for a user to get a virtual application up and running. Finally, some other areas have received the attention of the OpenNebula developers, like for example a better Gluster support through libgfapi, improved access to large pools pagination, or optionally limit the resources exposed by a host, among many others are included in Carina. This is a stable release and so a recommended update that incorporates several bug fixes since 4.6 RC. We’ve done our best to keep compatibility with OpenNebula 4.4, so any application developed for previous versions should work without effort. In any case, be sure to check the compatibility and upgrade guides. We invite you to download it and to check the QuickStart guides, as well as to browse the documentation, which has also been properly updated. As usual OpenNebula releases are named after a Nebula. The Carina Nebula (NGC 3372) is one of the largest nebulae the sky. 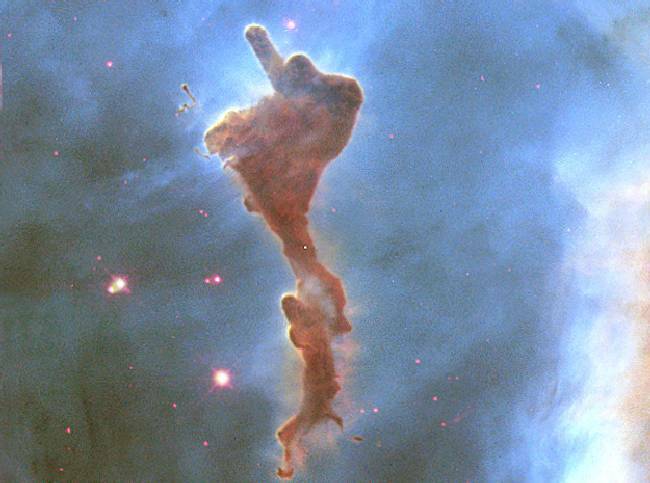 It can only be seen from the southern hemisphere, in the Carina constellation. The new features for VDCs, Federations and OVA support in the Marketplace introduced in OpenNebula 4.6 were funded by Produban in the context of the Fund a Feature Program. https://opennebula.org/wp-content/uploads/2018/11/opennebula_cloud_logo_white_bg-4.png 0 0 Tino Vazquez https://opennebula.org/wp-content/uploads/2018/11/opennebula_cloud_logo_white_bg-4.png Tino Vazquez2014-04-29 06:41:242014-04-29 10:37:23OpenNebula 4.6 Carina is Out! Both events are completely free and are very interesting for the community. They both feature a 4h hour tutorial in which you will learn how to install and configure an OpenNebula Cloud from scratch using CentOS. There are still some slots available for speakers and sponsorship opportunities at both TechDays. Send us an email at events@opennebula.org if you are interested. The event in Boca Raton, Florida, is hosted by TransUnion|TLOxp which is a global leader in information and risk management. We will learn from them how they’re using OpenNebula to deploy their on-premise cloud. The event in Fremont, California, is hosted by HYVE Solutions which is a leader in providing large scale deployments of fully integrated racks of purpose-built datacenter servers, storage, and networking solutions. Among many other things we will learn about their OCP Open Rack solution and how used in conjunction with OpenNebula it delivers a robust On-Premise Cloud Solution. HYVE Solutions is the original OCP solutions provider, having built all of the servers and racks for Facebook‘s Prineville and Forest City data centers. During this event we will have the chance to participate in the Manufacturing Plant Tour of the Facebook OCP Racks. Many thanks to TransUnion|TLOxp and HYVE Solutions for hosting these events. Looking forward to seeing you there, these are two events you cannot miss! The OpenNebula team is pleased to announce the release candidate of AppMarket 2.0. In addition to the features included in the previous beta release, this version features a new simplified import dialog and fixes minor bugs reported by the community. Also, AppMarket Worker has been extended to support other OVF versions. This new version can be downloaded from the OpenNebula download page and information on how to install and use it is available in Github. We have a new addition to our Addon catalog, that delivers the necessary scripts for Windows Contextualization, in order to simplify and ease the use of Windows Virtual Machines in an OpenNebula Cloud. Configure the Network, using the automatically generated networking variables in the CONTEXT CD-ROM. Run arbritary PowerShell scripts available in the CONTEXT CD-ROM. All this functionality is implemented by a very easily customizable PowerShell script. 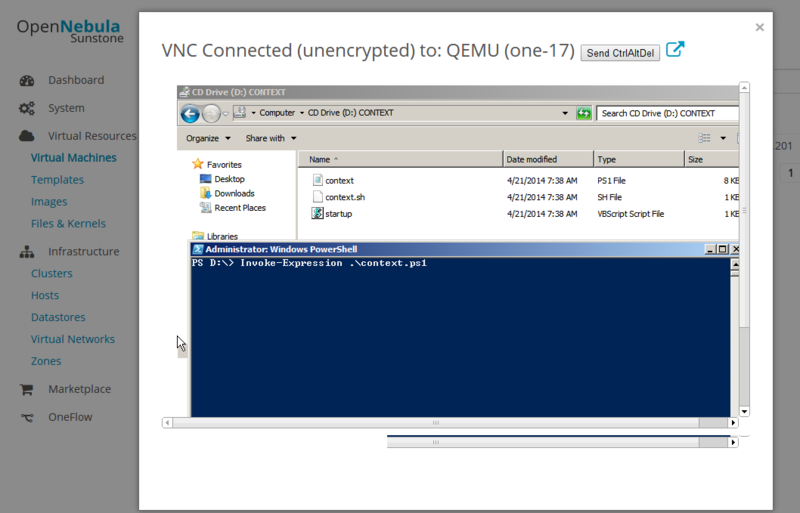 The documentation also includes the procedure for installing and provisioning a Windows VM from scratch. Big thanks to André Monteiro and Tiago Batista from the DETI/IEETA Universidade de Aveiro, since this addon is largely based on their work. The orginal guide is available here: OpenNebula – IEETA. André Monteiro is also part of the now official addon. The OpenNebula project is proud to announce the availability of OpenNebula 4.6 RC (Carina). This release brings many new features and stabilizes features that were introduced in previous versions. 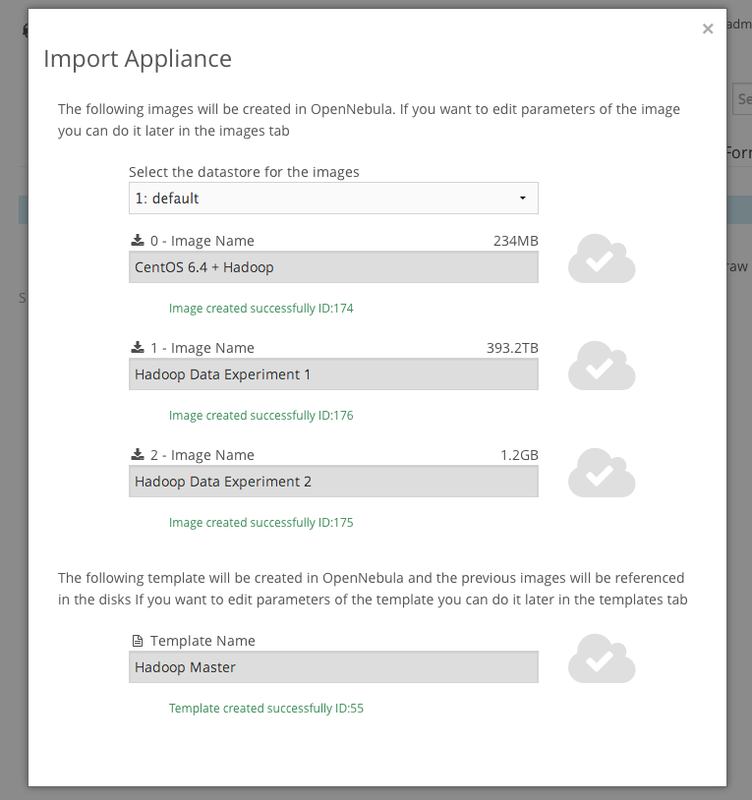 OpenNebula 4.6 introduces important improvements in several areas. The provisioning model has been greatly simplify by supplementing user groups with resource providers. This extended model, the Virtual Data Center, offers an integrated and comprehensive framework for resource allocation and isolation. Another important new feature has taken place in the OpenNebula core. It has undergone a minor re-design of its internal data model to allow federation of OpenNebula daemons. With OpenNebula Carina your users can access resource providers from multiple data-centers in a federated way. With Carina the OpenNebula team has started a journey to deliver a more intuitive and simpler provisioning experience for users. Our goal is level the final user usability with the system administration and operation ones. First, the Sunstone graphical interface has been tweaked to help the user workflows. It has also been improved in order to support the new Marketplace version, which makes even easier for a user to get a virtual application up and running. Finally, some other areas has received the attention of the OpenNebula developers, like for example a better Gluster support through libgfapi, improved access to large pools pagination, or optionally limit the resources exposed by a host, among many others are included in Carina. https://opennebula.org/wp-content/uploads/2018/11/opennebula_cloud_logo_white_bg-4.png 0 0 Jaime Melis https://opennebula.org/wp-content/uploads/2018/11/opennebula_cloud_logo_white_bg-4.png Jaime Melis2014-04-11 17:47:472014-04-12 20:17:27OpenNebula 4.6 RC Released! Effective memory used by all system processes. Here is a screenshot showing an overview of CPU used. oneInsight is a new project, and there is a lot of things concerning data visualization in OpenNebula. Contributors are welcome, we apply the Github Pull Request model for contributions in code and documentation. Stay tuned. With OpenNebula 4.6 Beta released, the team is working full throttle ironing out wrinkles: fixing bugs, polishing the interface, prepping the documentation, updating related components and applications, etc. It is a lot of work, but we want our users to experience a migration as smooth as possible. One of the main contributions of this new release is a big boost to the provisioning model. Besides the Sunstone interface facelift, including tweaks to help the user workflow, there has been a number of provisioning ideas developed in this release. For instance, Sunstone integration with marketplace has also been improved in order to support the new AppMarket version, which makes even easier for a user to get a virtual application up and running. Moreover, the provisioning model has been greatly simplify by supplementing user groups with resource providers. This extended model, the Virtual Data Center, offers an integrated and comprehensive framework for resource allocation and isolation. The latest addition to the provisioning model improvement is the new provisioning view for cloud end users. This view ensures a minimal and utterly simple portal to consume cloud resources. All the clutter is out of the way to make the experience as pleasant as possible. Give it a spin! The other significant features that will be present in OpenNebula 4.6 includes the ability to achieve a federation using OpenNebulas (yes, plural is coming!) at different datacenters. 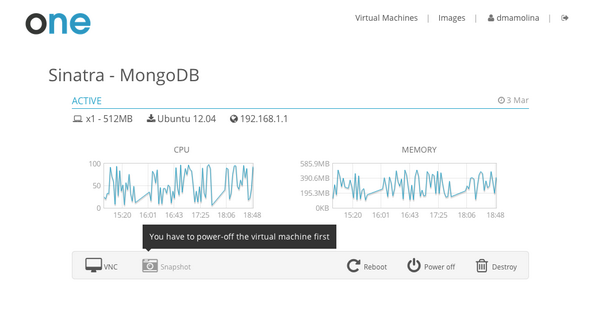 Check out the screencast on partitioning clouds with vDCs to get a feel on this new functionality. Also, 4.6 will feature the ability to import OVAs into OpenNebula via AppMarket, and will be a complete translation and import of all the resources defined in the OVA: disks, capacity, network, etc. Other aspects that are being revisited are storage backends, virtual networking, datastore, image and VM management and Sunstone. You can find a comprehensive list here. Some of the above features have been sponsored by Produban in the context of the Fund a Feature program. 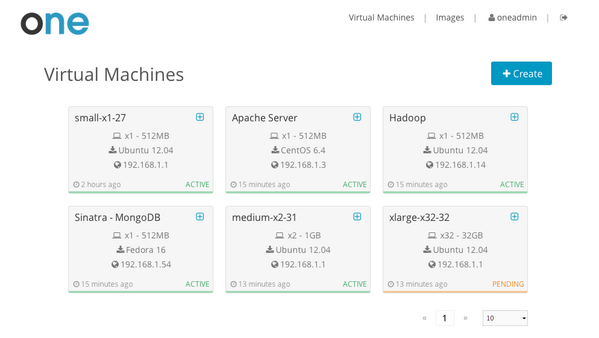 Another technology contribution by OpenNebula members is summarise in this post about integrating puppet and OpenNebula: Automatic configuration of VMs with Puppet. Moreover, integration with GlusterFS (a distributed filesystem with replica and storage distribution features that come really handy for virtualization), was also addressed in the Native GlusterFS Image Access for KVM Drivers post. This month the community was as engaged as ever. We would like to give a big “thank you” to all the OpenNebula users that gave as feedback about the beta version of OpenNebula 4.6. The final release will be more robust due to you! The OpenNebula way of developing software is open, and user focused, The “voice” of the community really matters. The cliche “software made with and for the community” really applies here. If users get (positive) feedback about their input they feel appreciated and be more “connected” to the project. The “atmosphere” on the mailing list is friendly and open. No flame wars, or negativism here, so it keeps users “in” instead of pushing them away. Folks at CloudWeavers build this slick portable DC based on OpenNebula. Awesomely pretty! As usual, first things first, this year’s OpenNebula Conference will be held in Berlin as well, 2-4 of December, 2014. If you want to repeat or find out how it is for yourself, save the date! Following last month series of comparing OpenNebula with other similar projects, we published a new post comparing the balance between user base and community in both the OpenStack and OpenNebula projects. Check it out, it is an interesting read. We are setting up a number of OpenNebula TechDays around the world. These events are designed to learn about OpenNebula with a hands-on cloud installation and operation workshop, and presentations from community members and users. If you are interested in hosting or sponsoring one, let us know!. The first TechDay happened in Ede, Netherlands, and was hosted by BIT, a dutch internet service provider. You can read about the aftermath here. There will be two OpenNebula TechDays in the upcoming months in the USA, covering both the east and the west coast. The one in Florida will take place in Boca Raton the 19th of June, hosted by TransUnion, whereas the west coast will be covered by the Bay Area Techday the 24th of June, hosted by Hyve, which includes an exciting tour around the manufacturing plant of Facebook production racks. This month, the OpenNebula team participated in the Cloud Expo Europe 2014. As part of the Open Cloud Forum sessions about open source cloud solutions, there was an OpenNebula tutorial. Also, OpenNebula was present at the biggest IT fair in the world, the CeBIT 2014, were we hanged out the Netways booth. Our partners, Netways, represented OpenNebula in the FLOSS UK 2014. And, last but not least, our project director travelled to Greece for the Future Internet Assembly 2014, with a presentation aiming to show how OpenNebula is driving innovation in cloud computing, impacting the adoption of private cloud, and enabling business in the cloud. Closer 2014, Barcelona, Spain, Apr 3-4, 2014. Open Nebula: La realidad del trabajo en la nube, Apr 9, Almendralejo, Spain. EGI Community Forum, Helsinki, Finland, May 19, 2014. HostingCon, Miami Beach, Florida, Jun 16-18 2014. GigaOM Structure, San Francisco, Jun 18, 2014. 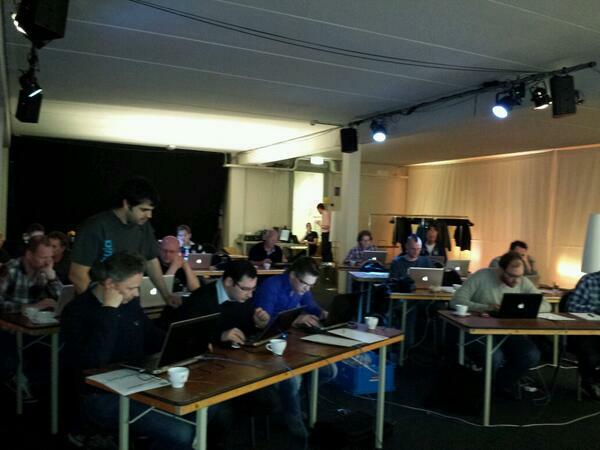 There are still available seats for the LOADays in Belgium, register now!. Attendees will build a virtualised two-node OpenNebula Cloud environment based on CentOS using VirtualBox and take it home. In the afternoon we will do a practical session on the process of creating images, contextualization and best-practices. OpenNebula will participate in the LOADays event that will be held this weekend, the 5th & 6th April in Antwerp, Belgium, with a talk about OpenNebula, about the new and exciting features of the last releases (featuring a live demo, of course) that will take place on Sunday, April 6th at 17h00. It’s a great event that you shouldn’t miss, with a strong emphasis on Linux and Unix sysadmins, and people interested in Free Open-Source Software in general. We guarantee plenty of interesting conversations, top-quality talks and a lot of fun.